Marduk-apla-iddina I, contemporarily written in cuneiform as dAMAR.UTU-IBILA-SUM-na and meaning in Akkadian: "Marduk has given an heir", was the 34th Kassite king of Babylon ca. 1171–1159 BC (short chronology). He was the son and successor of Melišipak, from whom he had previously received lands, as recorded on a kudurru,[i 2] and he reigned for 13 years,[i 3] during a time when the Dark Ages cast a heavy cloud over the contemporary events. He claimed, like his father, descent from Kurigalzu and evidently kept court in Dūr-Kurigalzu itself because tablets found in the burnt ruins of the Tell-el-Abyad quarter which marked the later Elamite destruction of the city, are dated in the first two years of his reign. These include lists of garments received or distributed for the New Year, or akitu, festival and indicate a normal economic relationship with Babylonia's western and eastern neighbors, the Subarians and Elamites respectively, whose singers apparently entertained the royal household. Documents surviving from his reign date only as late as his sixth year[i 4] and include his repair of the E-zida temple at Borsippa,[i 5] where he credited the god Enlil with raising him to kingship despite recording this in an inscription wholly dedicated to Marduk. There is evidence of thriving commerce in woolen garments with Assyrian traders,[i 6] and numerous royal land grants in northern and especially northeastern Babylonia. The Chronicle of the Market Prices[i 7] references his 21st year, but neither king with this name ruled longer than 13 years. Like his two predecessors, some of the economic texts show a curious double-dating formula which has yet to be satisfactorily explained. The Synchronistic King List[i 8] gives his Assyrian contemporary as Ninurta-apal-Ekur, which is unlikely as he is also shown against the earlier two Kassite kings, despite his short reign. Several inscribed kudurrus, or boundary stones, survive which document large donations of land and tax exemptions during his reign. Marduk-zākir-šumi, the bēl pīḫati, or provincial governor, was the beneficiary of a piece of land as a perquisite from the king. He was son of Nabû-nadin-aḫe, grandson of Rimeni-Marduk, great grandson of Uballissu-Marduk, who had been šatammu, or an official under Kurigalzu II’s regime and descendant of Arad-Ea, um-mi-a-niğ2-kas7, scholar of accounting. His responsibilities included inspector of temple and land and controller of forced labor. [i 9] One of the witnesses was Nabû-šakin-šumi, also described as “son of” Arad-Ea. Another stele records that Ina-Esağila-zēra-ibni, “son of” Arad-Ea, measured a field, after replacing the previous land surveyor. The continuity of the reign with those earlier in the dynasty is evident in a kudurru providing confirmation of an earlier land grant by Adad-šuma-uṣur[i 10] and a copy of a kudurru[i 11] from the reign of Nazi-Maruttaš, the original of which was destroyed when a wall collapsed on it. Kudurrus were also used to record legal settlements, and two examples include a lawsuit[i 12] concerning land in Ḫudadu (Baghdad?) province, on the Elamite border east of the Tigris from his accession year, and one[i 13] recording legal actions over a field. Around eighteen kudurrus could be assigned to his reign based upon the art-history of their iconography. The following lists those which actually identify him as the monarch in their texts. The events at the end of his reign are uncertain, but it is clear from later sources that it ended dramatically, when Elamite troops led by Shutruk-Nahhunte, who had married a sister of Marduk-apla-iddina, invaded Babylonia and sacked several cities, including the capital. Whether these events were the cause of his demise, or whether they followed a succession crisis in which Zababa-šuma-iddina, an individual whose relationship with Marduk-apla-iddina is unknown, attempted to succeed him to the kingship, has yet to be determined. The Prophecy A[i 17] text may portray him in the figure of the 4th king, whose 13-year reign ends with an Elamite attack on Akkad, the booty of Akkad taken away, confusion, social disorder, usurpation and famine, events which seem to mirror much of what is known about this period. ↑ Kudurru of Gula, Sb 31, published as MDP X 95. 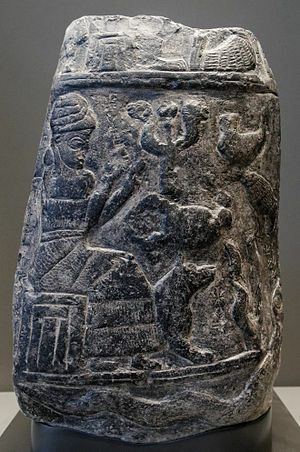 ↑ Land grant to Marduk-apla-iddina kudurru Sb 22, excavated at Susa and currently in the Louvre. ↑ Kinglist A, BM 33332, ii 13. ↑ Namely, tablet IM 50025. ↑ VS 1, 34, VAT 4131. ↑ Chronicle of Market Prices (ABC 23), BM 48498, lines 10 and 11. ↑ Synchronistic King List ii 9. ↑ 9.0 9.1 9.2 Land grant to Marduk-zākir-šumi kudurru, BM 90850, published as BBSt 5. ↑ 10.0 10.1 Adad-bēl-kala kudurru AS 6035 (Sb 169) published as MDP VI 42. ↑ 11.0 11.1 Kudurru of Nazi-Maruttaš, Sb 21, published as MDP II 86. ↑ 12.0 12.1 Land grant to Munnabittu kudurru, Sb 26, published as MDP VI 31. ↑ 13.0 13.1 Kudurru of Marduk-apla-iddina, Sb 33 (AS 6018), published as MDP 6 39. ↑ Uzbi-Enlil kudurru, IM 67953, published as Sumer 23 (1967) 45–67, pl. 1–6. ↑ Kudurru of Marduk-apla-iddina, NBC 9502, partially published as Hallo & Simpson (1988) 100, fig. 21. ↑ Tehran kudurru, published as Borger AfO 23 (1970) 1–11. ↑ Prophecy A, tablet VAT 10179, KAR 421. ↑ dAG dNa-na-a ù dTaš-me-tum bēlē šipṭi u purussê ana lemutti lisḫurūš ana la ṭābti [liš]te'uš. ↑ Douglas B. Miller, R. Mark Shipp (1996). An Akkadian Handbook. Eisenbrauns. p. 58. ↑ D. J. Wiseman (1975). "XXXI: Assyria and Babylonia, 1200-1000 B.C.". In I. E. S. Edwards. Cambridge Ancient History, Volume 2, Part 2, History of the Middle East and the Aegean Region, c. 1380-1000 BC. Cambridge University Press. p. 445. ↑ 3.0 3.1 J. A. Brinkman (1976). "Marduk-apla-iddina I". Materials and Studies for Kassite History, Vol. I (MSKH I). Oriental Institute of the University of Chicago. pp. 247–252. ↑ J. A. Brinkman (1999). Dietz Otto Edzard, ed. Reallexikon Der Assyriologie Und Vorderasiatischen Archäologie: Libanukasabas - Medizin. 7. Walter De Gruyter. p. 374. ↑ Tallay Ornan (2005). The Triumph of the Symbol: Pictorial Representation of Deities in Mesopotamia and the Biblical Image Ban. Vandenhoeck & Ruprecht. p. 47. ↑ Irving L. Finkel, Markham J. Geller (1997). Sumerian gods and their representations. STYX Publications. p. 71. ↑ Ursula Seidl (1989). Die Babylonischen Kudurru-Reliefs: Symbole Mesopotamischer Gottheiten. Academic Press Fribourg. pp. 33–40, 222. ↑ Kathryn E. Slanksi (2003). The Babylonian Entitlement narûs (kudurrus): A study in their form and function. ASOR. p. 296. ↑ Tremper Longman (July 1, 1990). Fictional Akkadian autobiography: a generic and comparative study. Eisenbrauns. p. 161.